For many years, Caymus Conundrum ($19.99), from the Wagner Family of wines, has been one of my favorite go-to white wines. --- I love it alone as an aperitif, or paired with Asian and Alsatian dishes, and even as a dessert substitute. It's just sweet enough to make for a pleasant and light after-dinner sipper following a heavy meal. Conundrum is a nontraditional white wine blend made of Chardonnay, Sauvignon Blanc, Muscat Canelli, Semillon and Viognier, sourced from California winegrowing regions as diverse as the grape varieties in it: Monterey, Napa, Santa Barbara and Tulare counties. With that vibrant varietal mix, you can expect beautiful floral aromas, teamed with flavors that are elegant and exotic. Conundrum winemaker Jon Bolta keeps each fruit parcel separated throughout the winemaking process -- some varietals are aged in oak, others in stainless steel -- with all ultimately blended into Caymus' totally unique white wine, Conundrum. 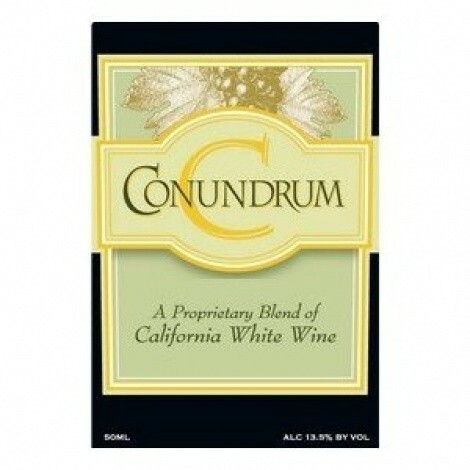 I've always thought of Conundrum as a "pretty" wine. Flavors and aromas of honeysuckle, tangerine and pear mingle with apricot, melon and hints of spicy vanilla. While it is harmonious with a wide range of foods, I find that Conundrum tangos especially well as a dance partner with ceviche, sushi and sashimi. And yet, I also like it with choucroute garnie. It's a terrific wine to stock up on for the holidays -- a real crowd-pleaser.